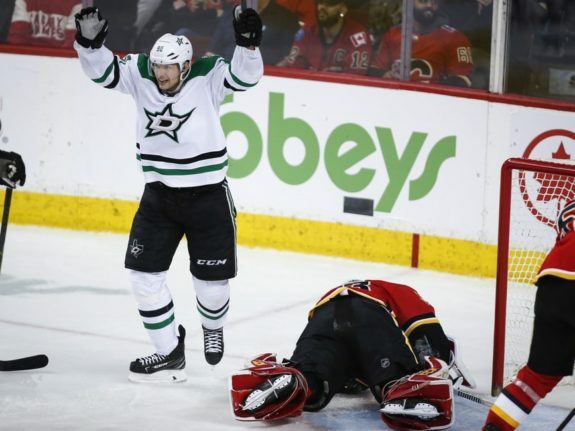 CALGARY — Miro Heiskanen scored the winner in the Stars’ 2-1 victory over the Calgary Flames on Wednesday, but the Dallas victory was tainted by an injury to goaltender Ben Bishop. Play was blown down with Bishop down on his knees in obvious discomfort at 13:22 of the second. He skated off the ice under his own power but went straight to the dressing room. Alexander Radulov also scored for the Stars (40-31-6), who swept the season series against Calgary, winning all three games. Currently holding down the first wild card spot in the Western Conference, Dallas moved within four points of St. Louis for third in the Central Division. The Blues hold a game in hand. TJ Brodie scored the lone goal for Calgary (47-23-7). The Flames’ lead over San Jose atop both the Pacific Division and Western Conference remained at six points. Anton Khudobin, who made 15 saves in relief, is credited with the win. He improves to 14-16-4. Bishop had 20 stops before exiting. The only goal of the opening two periods came at 17:26 of the first on a power play on a pretty individual effort from Radulov, aided by some poor defending by the Flames. Picking up the puck behind his own net, Radulov slowly carried the puck up ice uncontested. As he approached the Flames blue-line, he stickhandled right through the closely-bunched Calgary trio of Mark Jankowski, Elias Lindholm and Brodie with relative ease and strolled in alone on Rittich, beating him through the pads with a move to his backhand. The Stars made it 2-0 on a second power-play goal at 12:24 of the third with Heiskanen scoring from a scramble. Dallas finished a perfect 2 for 2 with the extra man. Brodie finally got Calgary on the scoreboard at 18:28 of the third, converting a Johnny Gaudreau rebound. The NHL’s highest scoring team at home, Calgary has mustered just one goal in the first two games of this three-game homestand. The Flames lost 3-0 to Los Angeles on Monday night. They will try to get back on track on Friday when the Anaheim Ducks are the visitors. It’s been feast or famine for Calgary offensively lately. They scored 29 times at the Saddledome during the five-game winning streak that preceded this stretch. Notes: Dallas improves to 29-1-2 when leading after two periods… The Stars have won six straight games against Calgary… Sam Bennett (upper body) missed his fifth game in the last six. He could play on Friday.